Are you ready? 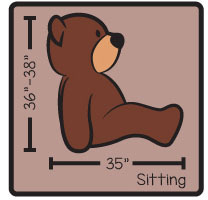 Six Foot Teddy Bears. You read that correctly! 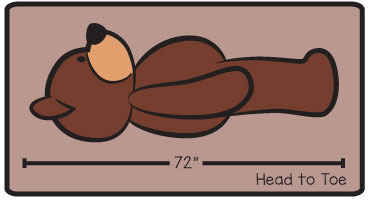 Our biggest 72in Valentine’s Day teddy bears are ready to impress your sweetheart with their super soft and snuggly fur in your choice of 7 beautiful colors. These bears are truly huge, but still so cuddly and huggable, with warm brown eyes, soft black noses and sweet smiles on their cute faces. They are wearing special shirts just for Valentine’s Day and make awesome gifts for someone special to your heart. You get to select your Valentine’s favorite color! Please use the pull down menu to make your color selection before adding it to the cart. 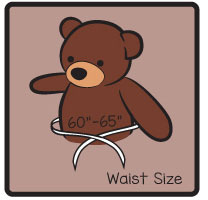 The custom shirt is specially sized for our 6ft (72in) teddy bears, and is washable and removable. White shirt with a large red heart and the text, ‘Be mine’ printed under the heart. *Note: this shirt design does not feature any additional personalization options.